Optimism remains high for a strong, fair climate agreement, as native communities, developing nation women, small island states fight to retain human rights, equity and aid. 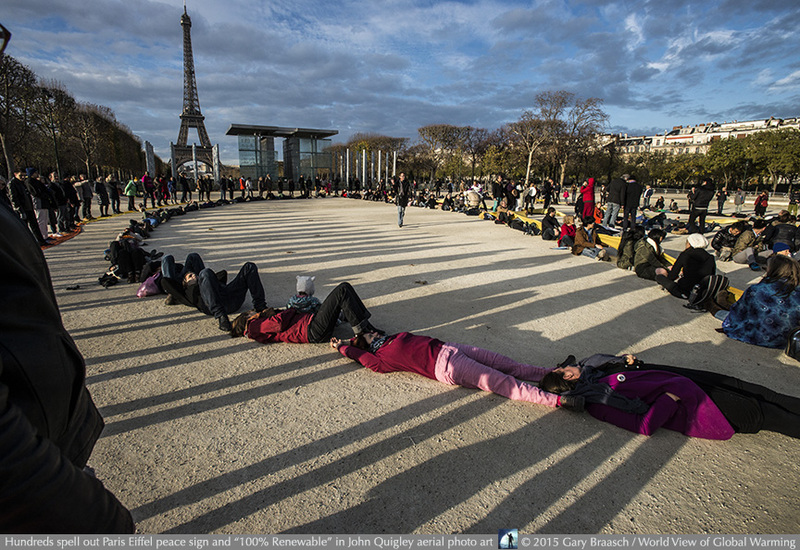 Optimism prevailed as the 21st meeting of the UN climate convention in Paris reached its halfway point. Since the dramatic gathering here Monday of more than 140 world leaders who made a nearly unanimous call for strong and rapid action to limit global warming emissions, national experts and negotiators have moved into closed meeting rooms to construct word-by-word the final language. The draft agreement has been whittled down from 54 pages of alternate wording to about 20 by week’s end. Crucial to the power and meaning of an agreement will be how much it protects and aids less-developed nations, poor local communities, women and children and minorities who now and in the future will be hit with the brunt of climate disruption. 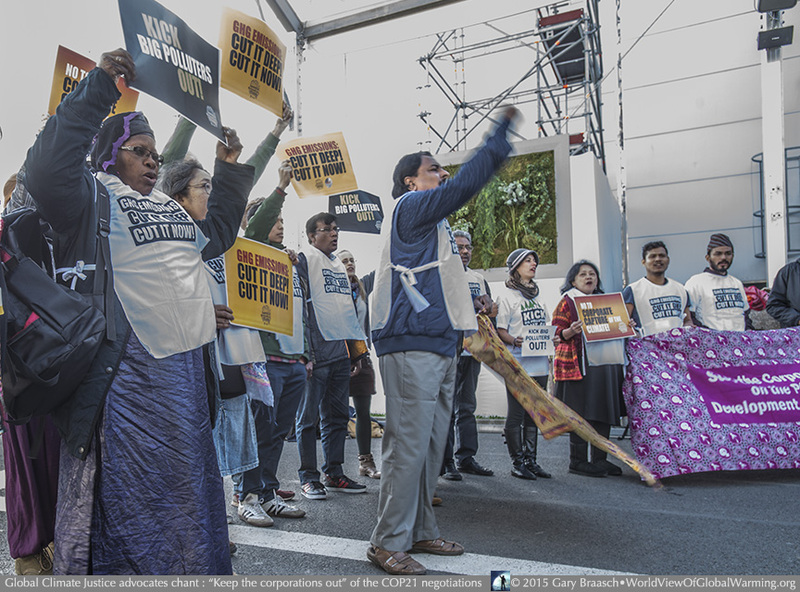 The negotiators will also decide to keep the goal set in previous meetings, to limit temperature from rising 2 degrees C (3.6 degree F) above the preindustrial level (the earth is already one degree warmer due mainly to unconstrained fossil fuel burning) or commit to trying to keep the temperature 1.5 degrees C above preindustrial. The work to create the first international agreement with strong provisions to limit global warming effects and protect the less-developed people who now suffer the brunt of disruption, is expected to be complete a week from now. Already the process is a success, in that emissions reduction plans (INDCs) representing 184 nations who create almost all the climate pollution have been submitted to the UN. U.S. chief negotiator Todd Stern called this “absolutely unbelievable,” to have such coherence in what has been a fragmented and unsuccessful system so far. Many diplomats, environmentalists, civic spokespeople and business leaders gathered here in the largest meeting of its kind ever remained upbeat about chances of success – an ambitious, comprehensive, fair and binding pact among all nations to act to reduce global warming carbon emissions to near zero before he end of this century, by following, reporting on and strengthening those INDCs. It would be first such agreement and the culmination of a scientific, social and diplomatic movement that began with the ratification of the UN Framework Convention on Climate Change in 1992. -- How the promised national emission reduction plans would be monitored, reported and strengthened. Many nations including the U.S. will resist being bound to exact reduction timetables, but will want all nations to be transparent in how they calculate, monitor, report and change their plans, according to their own national circumstances. -- Full recognition of the plight of the most affected by climate change, island states and the less developed nations, and aid in the form of insurance, loss and damage payments, and funds for reduction of climate pollution and adaptation to sea level rise and other changes. President Obama promised an insurance plan for nations at risk like the small island states of the Pacific Ocean, but his negotiator Todd Stern flatly said the U.S.” can’t cross the line into liability.” Protection from and compensation for climate damage has been a major cry from women’s and less developed community groups in demonstrations and press conferences this week. 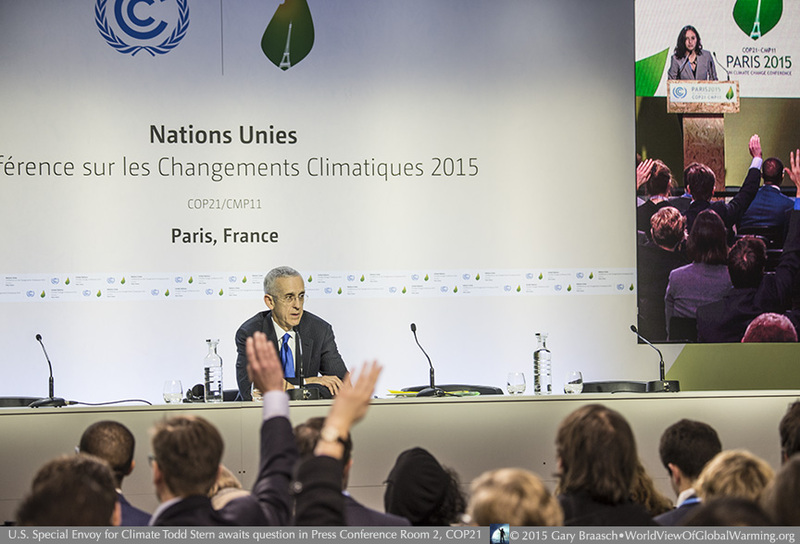 -- Whether the concept of climate justice will be addressed in binding terms. A proposed version of an agreement was being circulated that spelled out human rights, gender equality, the right to health, recognition of indigenous cultures, and the integrity of ecosystems and of the Earth. 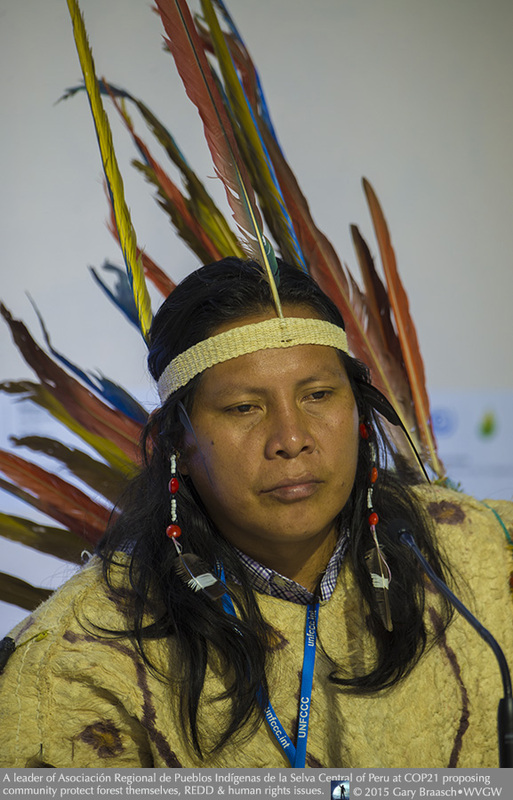 Climate justice is being urged by a wide span of interests from business groups to indigenous individuals from Peru who wore native dress into meetings and press conferences. Many people from forested regions were advocating various forms of forest protection to cut pollution, sequester carbon and harbor biodiversity (called REDD in convention language), and some opposed any continuation of forest “management” by corporations and industrialized nations. Central to all of this and more was whether the consensus process within the UN convention could deliver a strong, binding, transparent and equitable agreement now. Already nations like Saudi Arabia are blocking provisions in draft wording relating to a 1.5 degree temperature limit. A UN study which the Saudis stopped from being referenced in a current agreement draft said 100 million people would be affected if temperature were allowed to rise 2 degrees rather than 1.5. A majority of climate convention members supports a 1.5 degree limit. 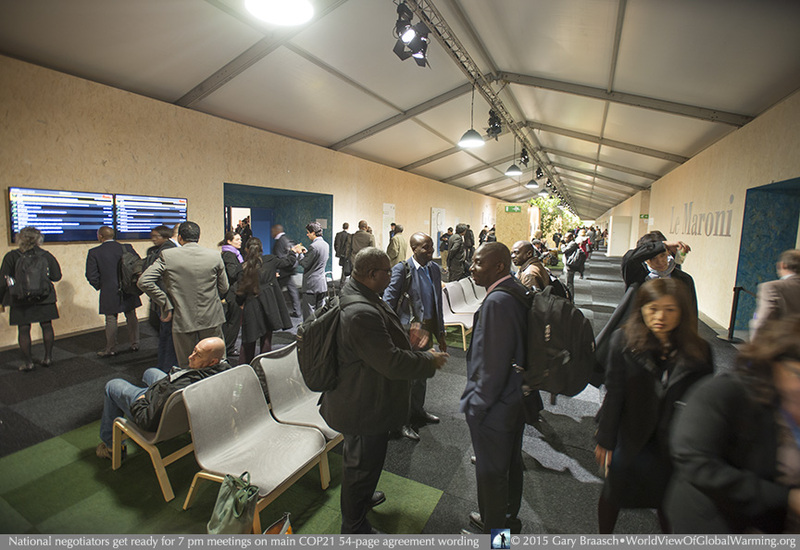 Renewable and clean energy to carry out the needs of the world for health, climate and fairness was being put forward in many studies and reports, in advance of the climate meeting. The first day of the COP, with Obama and President Hollande of France, Bill Gates announced a multi-billion dollar fund for accelerated clean energy development and deployment.